Toyota Corolla Exterior Styling Pros and Cons | Page 1 of 2 | Why Not This Car? This is a very nice car to look at inside and out. Exterior is styled conservatively and is easy to clean because there are no odd crevices and sharp corners. Minimal use of black plastic is a plus to prevent sun fading. Toyota is the king of the boring-mobile. Just because a car is an appliance doesn't mean it can't look good. Plenty of other entry level cars manufacturers seem to get this, but not Toyota. Very sporty looking and nice shade of blue. It looks really upscale compared to an Honda Civic, Mitsubishi Lancer or a Nissan Sentra. 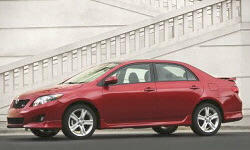 Its chrome accents, 16" alloy wheels, and profile make the Toyota Corolla a small scale Camry. Spory, Clean yet classy look. Clear lense Euro look.